Important data is increasingly created and edited on the road. Mobile workstations and freelancers is increasingly created and edited on the road. Mobile workstations and freelancers have been a challenge for backup since they are connected irregularly. P4 Backup2Go was developed with this in mind. If you're at a hotel or at a customer site or at home, the first backup can be run within minutes. With almost no setup required, Drobo gives you BeyondRAID data protection immediately! Backup takes place automatically and in the background. P4 Backup2Go uses enterprise-level backup technology and is easy to configure—being able to manage and restore data from your browser makes backup really simple. 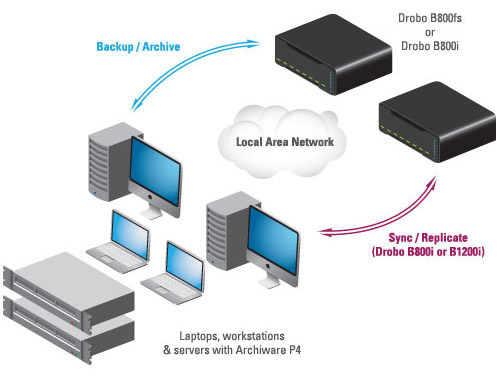 And Drobo is the storage that simply works for SMB and departments in larger companies. 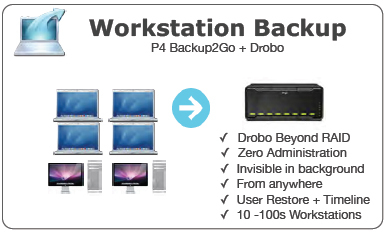 Drobo and P4 make backup simple and safe. Fully automatic Backup with centralised control, completion after interruption, optimised for laptops. Drobo as professional storage with BeyondRAID immediately ready with minimal configuration, increase storage with disks of all capacities and manufacturers. Fully automatic Backup with centralised control, completion after interruption, server Backup with versions and snapshots. 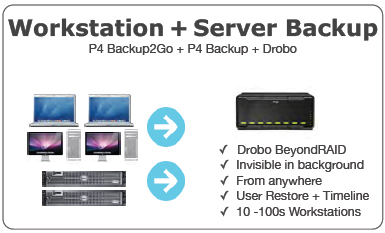 Professional Drobo storage with iSCSI, increase storage with disks of all capacities and manufacturers.